Director's cut: WTF is wrong with this guy! WTF is wrong with this guy! First it was Google Earth, Obama and the Beijing Olympics that boiled over into what is now being remembered as "The Arab Spring." But wait, Friedman is now blaming Climate Change. Which might almost make sense, except it is not any hotter in the deserts of the middle east to have provoked thirsty Arab farmers into revolting against autocrats. No, it was the drought in Kansas. Wait, what? 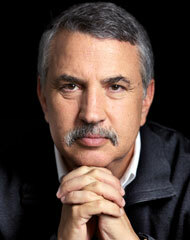 That's right, Thomas Friedman has connected all the dots, and then some, between Kansas and the Arab Spring. Also, too, al Qaeda. Here, read all about it: Kansas and Al Qaeda.